I learned this recipe from my husband Lulu's aunt Huma. I call her Huma Chachi because she's Lulu's father's sister-in-law. She's an amazing cook and can put on the most wonderful feast in the twinkling of an eye. Recently, Huma Chachi prepared chicken methi. 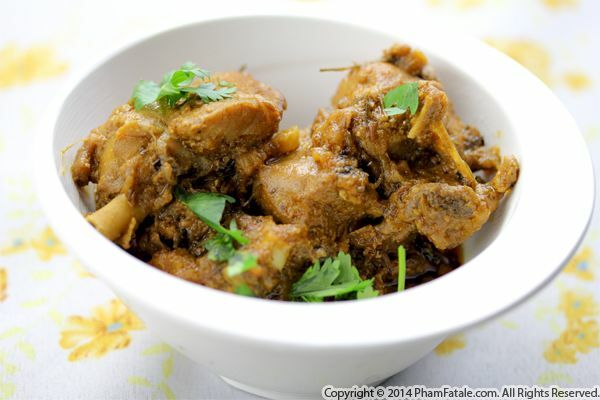 It's an Indian chicken curry made with dried fenugreek leaves. Baby Aria loved it so much, I replicated the same recipe days later. It's best served with steamed basmati rice. Ultay pultay is what my father-in-law (I call him "Daddy"), who's a vegetarian, considers a festive dish. This dish is composed of thin, firmly pressed chickpea pancakes soaked in spicy gravy. The cooking time was a bit a long but seeing Daddy enjoy his meal was so rewarding. I learned to make ultay pultay from Lulu's paternal grandmother's sister. The entire family calls her Muni Baji in Urdu, which translates to "little sister" in English and she's indeed the youngest of a large brood; Lulu's grandmother was the eldest. It was a lot of fun learning the curry dish from Muni Baji. She told me a lot of stories about her life in Hyderabad. For instance, the gravy calls for fried onion paste and back in the day, there was no blender so it was puréed by hand! 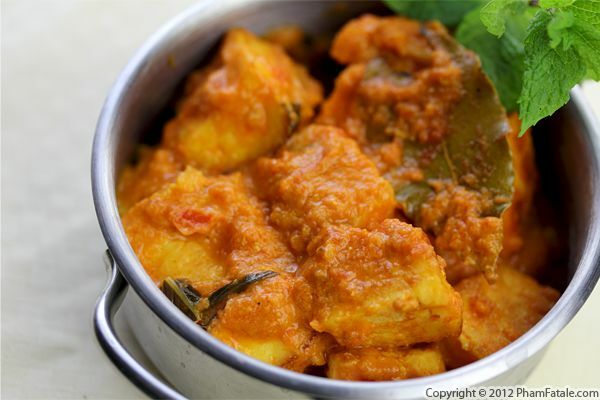 Paneer masala is pan-fried paneer cheese simmered in a spicy, creamy sauce. It is amazing with plain basmati rice or hot naan. But instead of serving this dish the traditional way, I used it as a filling for mushrooms. The bold flavor of the curry sauce marries beautifully with the earthiness of the mushrooms; they make the most delicious fusion appetizers. The idea for these cute appetizers was inspired by my aunt, Ma Mười. She told me the first time she tried Indian food years ago at a restaurant, she was served a lot of little metal tins filled with colorful sauces. After a while, she asked the waiter when her main meal was going to arrive. She thought they were condiments and didn't realize that was her entire meal. 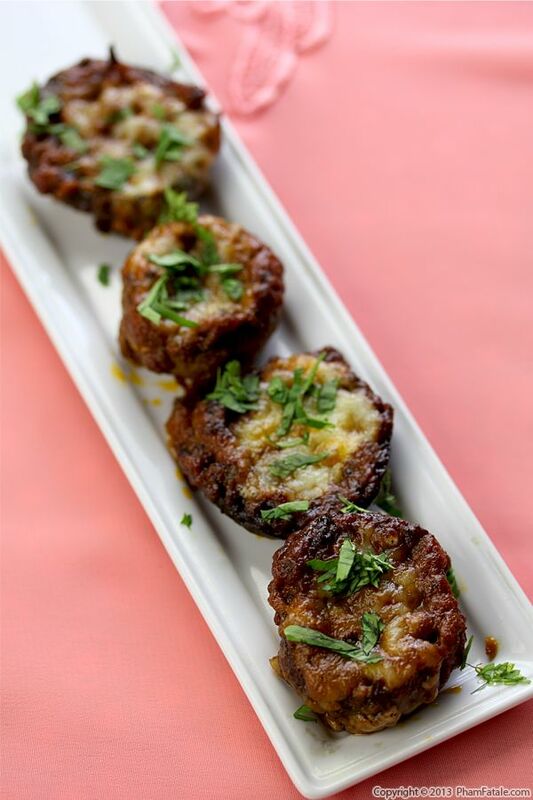 These appetizers showcase the wonderful flavors of Indian cuisine for those who are not really familiar with this culture. I've prepared pizzas, "naaninis" and other fusion dishes with Indian toppings in the past. Indian cuisine is boldly flavored, so pairing it with simple and attractive presentation techniques is a low-risk strategy for producing delicious new dishes. I've prepared this Indian curry called korma countless times since I got married. I learned this dish from my husband Lulu's aunt (I call her Phoopi). 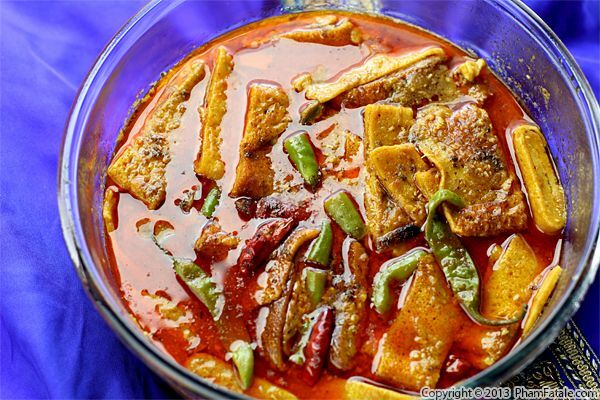 It's a very flexible dish that allows for many combinations of meat and vegetable. Chicken, beef, goat, potato, taro and various vegetables (peas, carrot, broccoli) are commonly used. The spicy gravy is what's constant. The gravy is made of fried onion paste and yogurt and is flavored with ginger-garlic paste as well as several Indian spices. 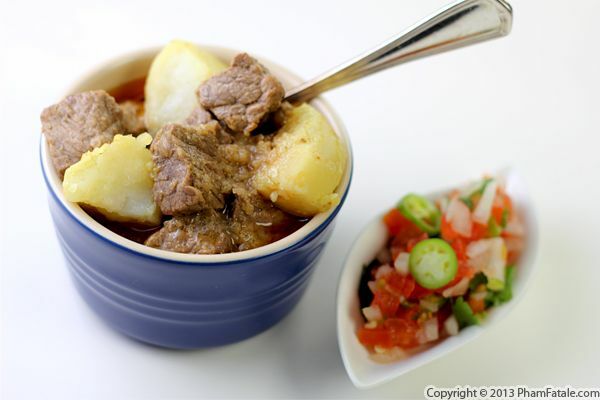 This version contains beef but you can easily omit the meat if you're preparing a vegetarian version. I had initially planned to include aloo korma ("aloo" is Urdu for "potato") in my first cookbook, Haute Potato: From Pommes Rissolees to Timbale with Roquefort, 75 Gourmet Potato Recipes, but finally went for other Indian dishes such as kheema cutlets (Indian-style meat-filled pancakes), panipuri (bite-sized, crispy South Indian masala potato-filled appetizers) and aloo bonda (spicy potato fritter) to name a few. I don't make paneer makhani very often because of the calories, particularly since I started working out to lose the baby weight. But today I had an excuse: I had leftover cream from making a white peach macadamia tart (which I'll share tomorrow), a bucket of freshly picked tomatoes and a bag of cashew nuts in the pantry. I marinated the cubes of paneer prior to pan-frying them. The tangy flavor from the lemon juice, yogurt and cream balanced wonderfully with the sweetness from the tomato sauce. I didn't feel bad eating the dish because it was so good!